Hollywood rarely misses an opportunity to self-mythologise. Each year sees a smattering of glossy biopics, ranging from the great (Ed Wood) to the alright (Hitchcock) to the downright dreadful (Grace of Monaco). It's a decent excuse to have some pretty A-listers swan around in tuxedos and retro frocks, vamping up that Golden Age Hollywood chic in a thick fug of cigarette smoke. Trumbo does all that, yet sets its sights on loftier goals. Its subject is Dalton Trumbo (Bryan Cranston), celebrated screenwriter and Communist. Set in postwar Hollywood, the film explores the impact of the notorious Hollywood 'blacklist' and the creeping onset of Cold War anti-Communist paranoia. The film is segmented into three loose acts. In the first we meet Trumbo at the height of his success; regarded by the studios as a guaranteed hitmaker and offered meaty writing contracts. He's surrounded by a loving family and living in bucolic rural luxury. 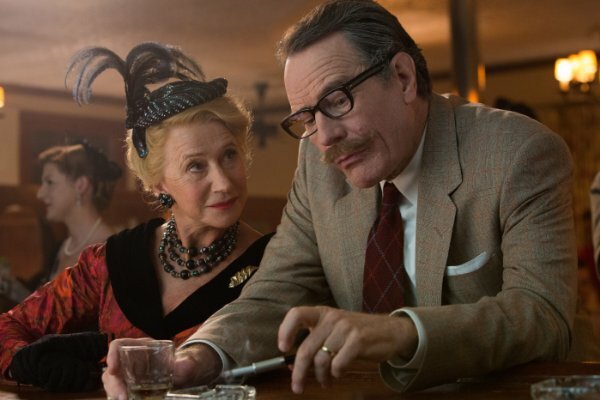 Soon, dark clouds appear on the horizon as gossip columnist Hedda Hopper (Helen Mirren) 'exposes' Trumbo as a left-wing political agitator. With the help of John Wayne (David James Elliott) and his 'Motion Picture Alliance for the Preservation of American Ideals', the rabidly anti-Communist Hopper pressures the studios to blacklist Trumbo and his political associates - who become known as the so-called 'Hollywood Ten'. We then slide into a 'Mr Trumbo Goes to Washington' style courtroom drama, following their legal battle with HUAC, before eventually settling into a study of how blacklisted screenwriters continued to work (and win Oscars) despite them being persona non grata. Trumbo tells this tale with a minimum of fuss and, as far as I can tell, provides ab accurate history lesson of the darker days of Hollywood. Purely on a surface level it's novel to see a piece of contemporary prestige awards bait that takes a passionate left-winger as its hero and dares to criticise 'legends' like the truly abominable John Wayne. 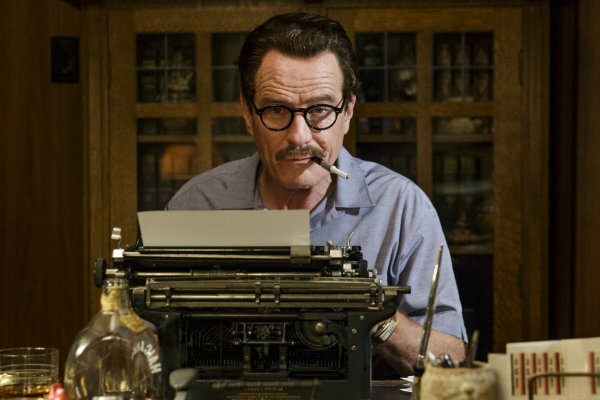 Cranston is excellent as the grumpy, sardonic and undeniably talented Trumbo. He's continually evolving: the emotional and physical toll of his experiences clearly visible in his features and behaviour. Cranston captures the essence of the man, sustaining even through resigned misery of humiliating induction to prison, his amphetamine fuelled bathtub editing sessions or the many interactions with family and friends. Great as all this is, Trumbo never rises too far above competent. It primarily falls into a familiar trap: how do you portray genius on screen? Sports and musical biopics have it relatively easy, but trying to make a genius writer cinematic often proves a tough proposition. Despite the many scenes of Trumbo slaving over a typewriter and furiously smoking, the film never comes close to analysing why his work on Roman Holiday, Spartacus et al is so magnificent. It settles for the lazy option: having practically every other character repeatedly state "this guy's a genius!" and hoping we'll go along with it. Secondly, we get a rather shallow view of Trumbo's Communism. The deepest we get is a risible sun-dappled horse-riding scene in which Trumbo's poppet of a daughter innocently enquires "Daddy, are you a Communist?'. Trumbo proceeds to explain that if she'd share her sandwich with a hungry classmate, then she's a Communist too. I guess technically that works, but Trumbo's Communism quickly proves indistinguishable from contemporary liberalism. Finally, there's a general lack of directorial oomph. Jay Roach, generally known for broad comedy (the Austin Powers series, Meet the Parents/Fockers and Borat) settles for a flavourless invisible style that's primarily two-shot, over the shoulder conversations. Things are further flattened out by a godawful plinky-plonky score that heavyhandedly commands you to feel emotion. For all that, I liked Trumbo. I knew about the Hollywood blacklist and the anti-Communist witchhunts going in, but the particulars of how writers got around it and consequences on individuals eluded me. After this I feel that I've got a decent handle on the whos, the whats and the hows. I just wish the film had a but more bravery and adventurousness. Trumbo is released 5th February.